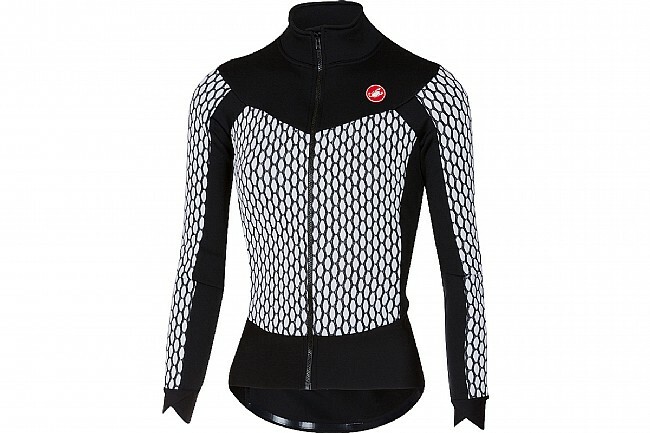 Featuring a sleek, form-fitting design, soft thermal fabric, and added coverage in key areas, Castelli’s Women’s Sfida Long Sleeve Jersey stands out on its own as a cozy single layer in cool conditions and when paired with other pieces as an integral element to staying warm in particularly chilly temperatures. The main body and sleeves feature Castelli’s new Nido D’Ape, a soft and stretchy 3D thermal fabric that provides warmth and moisture regulation. The Zen collar is asymmetric to prevent the zipper from irritating the skin or catching hair, and extended for extra coverage at the neck. Equipped with a scorpion pull tab, the YKK® Vislon® zipper grips and slides easily. Elongated cross-wrap flat wrist openings provide greater coverage and lay flat for easy layering with gloves or a jacket. The hem hangs a little lower, equipped with a silicone gripper that secures the jersey in place. Three rear pockets offer plenty of room for essential items. Reflective tabs on either side of the pockets increase visibility in low and flat light conditions, providing you with a little more peace of mind. Temperature Range: 12°-18°C (53 to 65°F). Extended collar with protective Zen construction. YKK® Vislon® zipper with scorpion pull tab. Nido d’Ape 3D thermal fabric on main body and sleeves. 3 rear pockets with perforated reflective band. Great fit, true to size. The fabric is fantastic, have received lots of complements on this jersey. Good for cool spring days. This jersey is extremely comfortable, warm and well made. I would highly recommend this product. Extremely stylish and the fit is great.